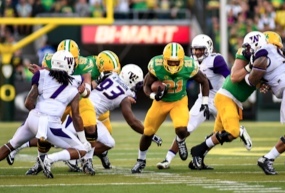 The phone lines between Coach Mike Morris (the Grizzled Ol’ Coach) and I have been burning up as we have been discussing the Oregon coaching staff’s introduction of an increasing amount of Pistol Offensive components into the Oregon Spread Offense. It was the Coach who called and noted the big step-up in Pistol variations against UCLA, but we hesitated to announce anything publicly until we had more confirmation — and we got it from the Washington game. What is Oregon implementing and why would they do it? Will this open up new complications for the Oregon offense, or is it a brilliant strategy to stay ahead of our Pac-12 competitors? Let’s take a look…. Josh Huff is the RB behind Darron Thomas. Can you believe who we had flanked out? How cool is that formation above? A Double-Pistol formation to run the Straddled Triple Option. Oregon ran that against Arizona State in 2011, and the play featured some of the best receiver blocking by Josh Huff ever. 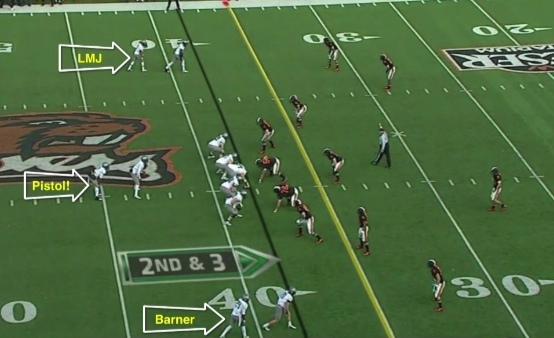 (See the video also in the Video Library above and look for “The Great Spread Offense Laboratory.”) The point is that Oregon has always had some Pistol variations in the playbook, and the reason I introduced these concepts is because of the emergence of noticeably more Pistol elements in Oregon’s game plans. 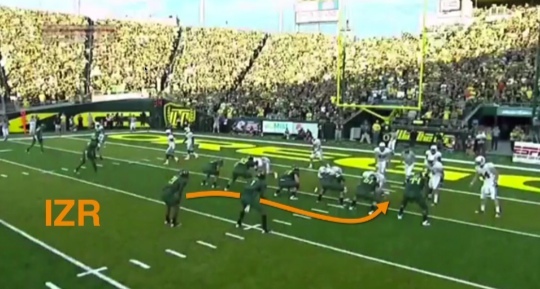 To understand why Oregon is moving in the direction of the Pistol, we need to look at the progression of how Oregon has run the foundation play of the Oregon offense, the Inside Zone Read. Above we see how it was originally run and continued to in some degree right up through last year. The running back started on one side, crossed the QB with the mesh and if he was passed the ball, he looked to explode into the “B” gap, the space between the right guard and tackle on the side opposite from where he began. What you see in screenshot above, and the GIF below, is the movement of the running back from behind and to the right of the QB, to up right, alongside and moving forward. This shift in how we do the Inside Zone Read has been evolving gradually over the last three years, and it appears to have completely transformed. Note the running back’s footwork above, as Byron Marshall turns and positions himself to moving forward on the mesh. Once he receives the ball he has complete vision of the line of scrimmage and has his shoulders and hips square. This allows him to choose any gap to run to on either side, as defenses were loading up on the offside at the beginning RB alignment. The RB also has better traction to make cuts as opposed to moving laterally and adjusting from there. The choices for the RB in the Inside Zone Read are “Bang, Bend, or Bounce,” and the GIF above is an example of Marshall running downhill or “banging” it. (I did not originate this language…the coaches did!) This is wonderful smash-mouth running and zone blocking. Kenny Bassett “Bounces” an Inside Zone Read. Above we see the Inside Zone Read played from a usual Shotgun formation, and the RB “bounces” it to the outside. 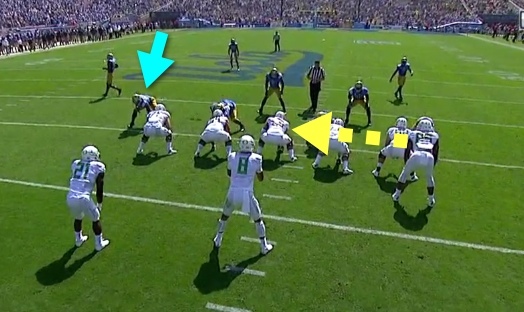 In the game against UCLA, we saw a Pistol blocking element (above) that we have not noticed being used in at least two years. Coaches all call it something different, but in Pistol parlance the Tight End to the upper right or H-Back is called the “F-Back.” As he runs behind the line of scrimmage (yellow arrow above), he targets and pulverizes the defensive end (light blue arrow above) to clear out a hole. It is pretty sweet blocking above by Pharaoh Brown on the Bruin DE, and with the zone blocking of Jake Fisher and Hamani Stevens, it is a ten yard gain on an Inside Zone play. Note I wrote Inside Zone, and not Inside Zone Read. 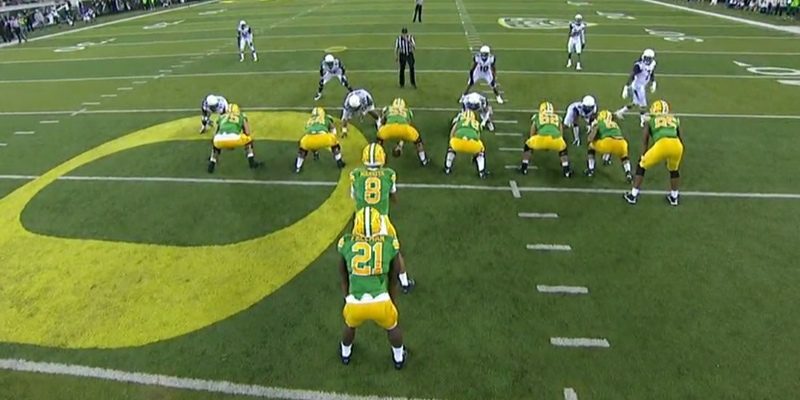 With the introduction of this blocking tactic, Oregon can protect its QB and expose him to much less pounding and risk of injury by removing the “read” element. 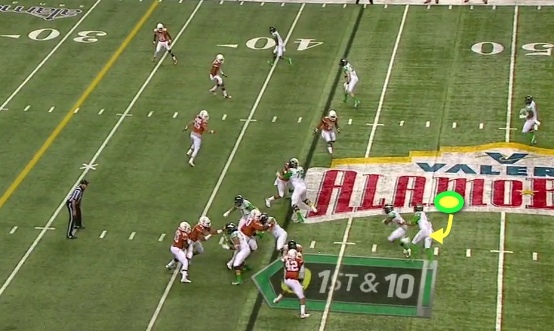 Hence, no running by Mariota on this play. Above is an example from the Washington game of how we lined up in a Pistol formation, ran the Inside Zone, and did NOT read any defensive player. 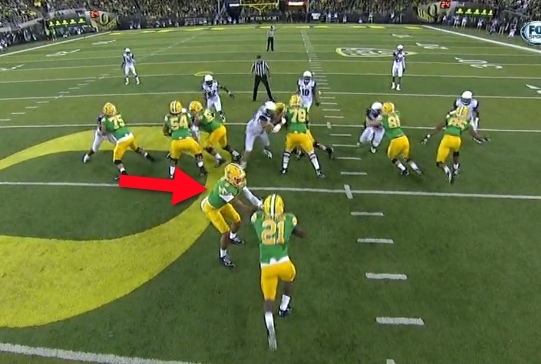 Note how Mariota (Red arrow) is not looking at a defensive player, but at Royce Freeman (No. 21) to make the handoff. The play above has no zone reading and the “F-Back” went forward to block, and not behind the LOS and across to the other side. It was a great example of how the RB can “bounce” it outside when things are jammed between the tackles. A Pistol with a Zone Read! This play above began in the Pistol formation, but unlike the last example we see Mariota in the middle of a Zone Read. The Duck tight end in front of the Husky being read (No. 41) is actually going to go around to block the linebacker, and Marcus knows this, hence the strong look at the read defender. The blocking is forming nicely as Grasu (No. 55) helped out Cam Hunt and has released to go after a LB. 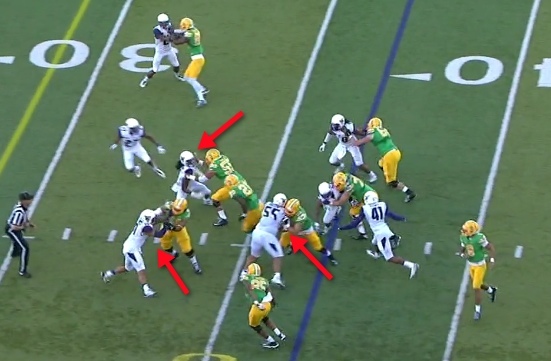 The yellow arrow points to a double team of Fisher and Stevens on massive nose tackle Danny Shelton (Husky No. 55). What a fun play to watch develop! Stevens and Grasu are superb at leaking to the next level and nailing the linebackers while Fisher keeps Shelton in check as Royce Freeman is speeding by. Great blocking is a wonder to watch, and I’m sure Oregon fans appreciate it that much more now! My Duck friends — the Pistol is here to stay as it is evidently a bigger part of the Oregon playbook now. The impact on the base play of the Oregon Offense is huge, as the Inside Zone either with the read or without can be run easily. The mesh, the reading and the zone blocking up front remain the same and are enhanced with the addition of the “F-Back” element to the blocking scheme. I do not see a downside to adding the Pistol as the Ducks can run everything in the offense as before — only a bit more efficiently — and can disguise plays better. The Pistol does not give away strength of formation, thus the defense has trouble lining up or figuring out the “playside.” When they line up balanced to Oregon’s offense it allows the Ducks to attack one side of the defense with a mismatch of blockers — in favor of Oregon. 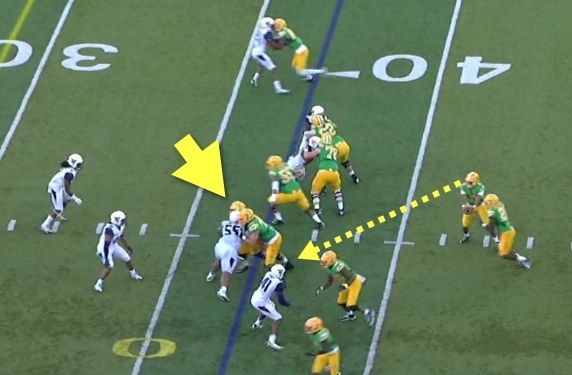 It was important to introduce the Pistol from the most important and foundation play of the Oregon Spread Offense, the Inside Zone Read, but Oregon has utilized several other plays out of the Pistol this season, including play-action passes. It will be fun to learn more about this new part of the Oregon arsenal, and while often plays are pulled out of the playbook for a particular game and then put away for extended time periods, I don’t think that will be the case here. We will see the same foundation plays of the Oregon offense in the Pistol formation. Special thanks to Coach Mike Morris. Without him and his passion and generosity, none of us would be learning about this breakthrough in the Oregon offense. In life, the “Grizzled Ol’ Coach” is a Pistol himself! I think this is truly a masterful move by the coaching staff to add parts from the Pistol that no other team in the conference utilizes, thus staying ahead of the Pac-12 rivals. Coach Helfrich is continuing the legacy of Chip Kelly; just when opponents start to figure out the Oregon combo — he changes the tumblers once again! Oh how we love to learn about our beloved Ducks!